Scientific evidence is crucial in a burgeoning number of litigated cases, legislative enactments, regulatory decisions, and scholarly arguments. Evaluating Scientific Evidence explores the question of what counts as scientific knowledge, a question that has become a focus of heated courtroom and scholarly debate, not only in the United States, but in other common law countries such as the United Kingdom, Canada and Australia. Controversies are rife over what is permissible use of genetic information, whether chemical exposure causes disease, whether future dangerousness of violent or sexual offenders can be predicted, whether such time-honored methods of criminal identification (such as microscopic hair analysis, for example) have any better foundation than ancient divination rituals, among other important topics. This book examines the process of evaluating scientific evidence in both civil and criminal contexts, and explains how decisions by nonscientists that embody scientific knowledge can be improved. 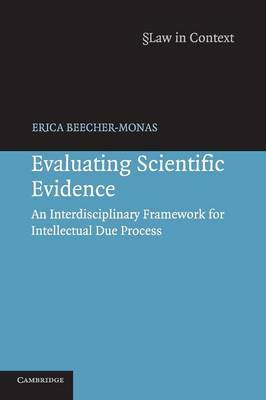 Buy Evaluating Scientific Evidence by Erica Beecher-Monas from Australia's Online Independent Bookstore, Boomerang Books. Erica Beecher-Monas teaches at Wayne State University Law School. She received her MS from the University of Miami School of Medicine and J.D. from the University of Miami School of Law, and earned an LL.M. and a J.S.D. from Columbia University School of Law. Prior to entering academia, she clerked for the Honorable William M. Hoeveler, United States District Court Judge in the Southern District of Florida, and was an associate at Fried, Frank, Harris, Shriver, and Jacobson in New York. She writes in the areas of judgment and decisionmaking, with applications to scientific evidence and corporate governance, and has been published in numerous law reviews.